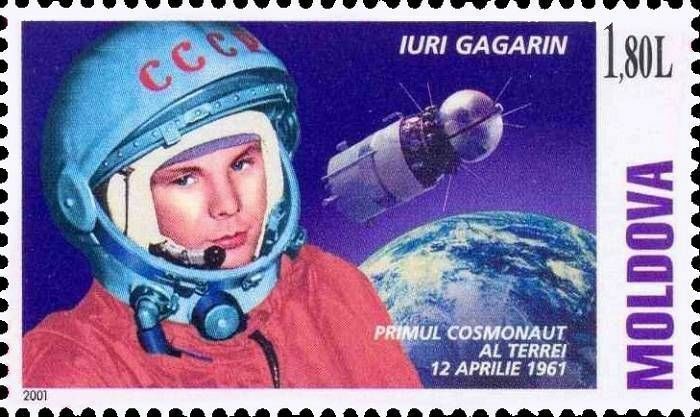 On 12 April 2001, the Post Office of Moldova (Poșta Moldovei) issued a postage stamp with the title 40th Anniversary of the First Manned Space Flight - Yuri Gagarin. The issue comprises one stamp, with an associated cancellation (postmark) and first day cover (FDC). The designer was Vitalie Roşca. The printing was performed by Bundesdruckerei, Germany. Yuri Alekseyevich Gagarin (Russian: Ю́рий Алексе́евич Гага́рин; 9 March 1934 – 27 March 1968) was a Soviet pilot and cosmonaut. He was the first human to journey into outer space, when his Vostok spacecraft completed an orbit of the Earth on 12 April 1961. Read more.. This article uses material from the Wikipedia article 'Yuri_Gagarin', which is released under the Creative Commons Attribution-Share-Alike License 3.0.